Sinister. When the supposed leader of the free world, hops into bed with the Chinese Communist Party-you just know that freedom will be the loser. 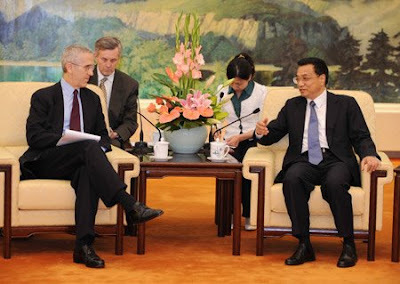 Chinese Vice Premier Li Keqiang (1st R) meets with Todd Stern, U.S. special envoy for climate change, at the Great Hall of the People in Beijing, capital of China, on June 8, 2009. Chinese Vice Premier Li Keqiang met with U.S. special envoy for climate change Todd Stern on Monday, calling for more dialogues and substantial cooperation with the United States on climate change. How is this different from when Bush, Reagan or Nixon jumped into bed with China's government. Let's make it clear-Nixon's opening to China in 1970s was an epic blunder. Reagan, Bush and clinton's China policies were all disastrous in terms of western security. What make's Obama's overtures even worse is the extent of possible China/US co-operation and the anti-growth policies it will promote and the huge implications for western security. Couldn't be written any better. Reading this post reminds me of my old room mate! He always kept talking about this. I will forward this article to him. Pretty sure he will have a good read. Thanks for sharing! Please come visit my site Local Business Directory Of Sacramento U.S.A. when you got time. Excellent article , i just share it with my friend of Italy. I Stumble UP your blog post , you will notice an increase of traffic within 24 hours for targeted people. Cheers . Please come visit my site Oakland Yellow Page Business Directory when you got time.